Do not add a stormdoor! 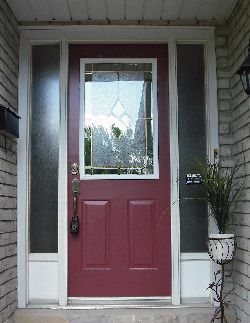 It is not recommended to add storm doors to metal doors especially not if the door is facing south. The heat build-up between the two doors can lead to warping and damage to mouldings and seals. In many cases this door is not seen as an exterior door but it is. As soon as you enter the cellar you are stepping outside. Therefore, this door should should be insulated, needs weatherstripping and a door sweep. The easiest and fastest way to ensure that this door is insulated properly is to install a pre-hung insulated metal door. These entry door systems are relatively inexpensive. Also, the space around the door frame should be insulated. Exterior wood doors. Exterior steel doors. Entry door systems. Professional door installation. Unless you have the know-how and the right tools, exterior door installation should be left to the expert. The purpose of doors is not only to control people traffic but also (in the case of exterior doors) to keep the heat in and intruders out. Doors and door frames should be able to take abuse (slamming), temperature changes and humidity. Entrance doors are usually made of solid wood or insulated steel, while interior doors are usually of hollow core construction. New door locks. If you have recently moved into a new home be sure to change the locks on all exterior doors since you do not know how many keys are 'floating around' in the neighbourhood, among relatives and friends of the former owner. Wood is the traditional material for doors. Solid wood doors should always be painted or stained on both sides to prevent warping. Hollow core doors should not be used as entrance doors. They provide no insulation and security. Steel. The insulated metal door is very popular with builders as well as homeowners because they are quick to install. Most insulated metal doors come 'pre-hung', that is, they come complete with door frame, sill and weatherstripping. These entry door systems are installed as one unit. This entrance door has one more important function beside the ones already mentioned. - Installing a door sweep. - Caulking around the door frame. - Installing an automatic door closer. All these measures will help to gas-proof your garage. A pre-hung insulated metal door is recommended for this location because it has excellent weatherstripping, and because of the insulation, is less likely to warp. PATIO DOORS and GARDEN DOORS.